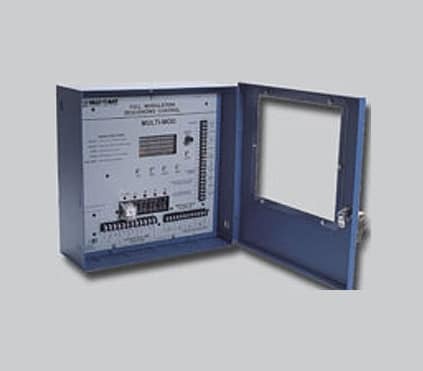 The Multi-MOD is an outdoor reset or set point control. It is the perfect control whenever multiple fully modulating stages are required for heating or cooling applications. The Multi-MOD controls the on/off and the modulation of each stage to maintain precise set point control using PID type control logic. 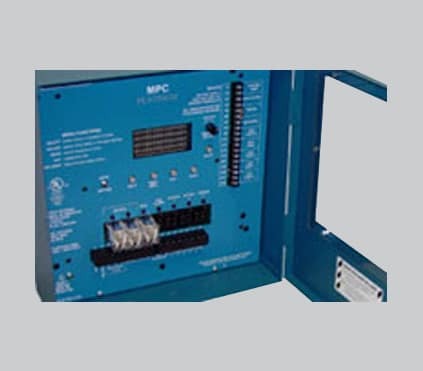 Controls Voltage, 4-20 mA, or 135 Ω modulating motors. The Multi-MOD is designed to accurately control the output from 0 to 100% of modulation for large variety of motors ( 0-5V, 0-10V, 1-5V, 2-10V, 4-20mA, and 0-135 Ω ) One Multi-Mod can even control two different types of motors. Only One Sensor. The Multi-Mod requires only one sensor located in the common output header of all stages. Digital Display of all System Settings. The Multi-MOD’s 80 character alphanumeric digital display names each system parameter in plain English and shows its precise value. The easy to follow menu system allows user to quickly make changes to any system setting without having to learn any specialized codes or keyboard commands. Password protection is available to prevent unauthorized users from making adjustments to control settings. Automatic Rotation among Stages. Rotating the first stage to be activated on a call for output promotes even wear on each stage. The Multi-MOD has three modes of rotation : Manual, First ON/First OFF, or automatically every selected time period from every hour to every 7 days. Outdoor Reset Capability. The Multi-MOD can be connected to existing or new Heat-Timer outdoor reset controls (HWR for hot water heat, or MPC for steam heat). The Multi-Mod also has built in hot water reset with adjustable reset ratios,offset and outdoor cutoff. Connects to Energy Management Systems. All Multi-MODs can be disabled by an Energy Management System(EMS) or other controller when there is no output requirement. Multi-MODs that control temperature systems can also accept a 4-20 mA input signal from an EMS to adjust the set point according to outdoor temperature or other factors. Monitors Stage Status. The Multi-MOD is designed to accept Lockout inputs from each stage. If any stage is in Lockout, the Multi-Mod will automatically skip it when adding more capacity. If a stage goes into Lockout during normal operation, the next stage will be activated immediately to maintain the desired output capacity. System Output is Active when Any Stage is Active. This output can be used to activate a system pump, combustion air damper, or perform any other function that is required when any stage is active. A System Prove input checks the status of components activated by the System output before stages can be activated. Internet Communication Upgrade Available. The Multi-MOD can be upgraded to communicate over the Internet to monitor and control all the Multi-MOD functions from a web browser. The Internet upgrade package also allows the Multi-MOD to accept sensors, to monitor their status, and to provide alarms if the sensor values are not in the correct range. In addition, Heat-Timer can provide a cellular Internet connection to the control (See Internet communication ). BACnet IP or MSTP Communication Upgrade Available. The Multi-MOD can be upgraded to communicate over a BACnet IP or MSTP network system to monitor and control all Multi-MOD functions. Modbus Communication Upgrade Available. The Multi-MOD can be upgraded to communicate over a Modbus RTU network system to monitor and control all Multi-MOD functions. DHW with or without priority on Internet packages. When a Multi-MOD that is operating a Hydronic system is upgraded to Heat-Timer’s Internet ICMS system, it will have DHW functionality as a feature with multiple settings to customize its operation. Additional features include: A purge timer, a low fire adjustment, a firing point setting for the next stage based on the firing rate of the current stage, a lag stage timer, a last stage hold adjustment, and many others. At times I notice the pressure reading on my Heat-Timer Multi-MOD is slightly above the pressure set point. Does this mean there is something wrong with the Multi-MOD? 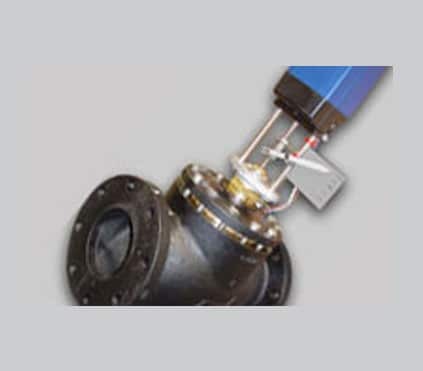 The set point on a Multi-MOD is not a high limit as it is on many other pressure controllers. 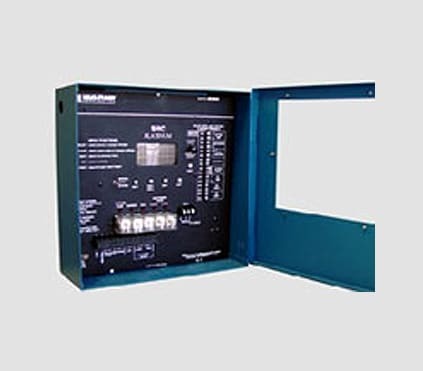 The Multi-MOD is designed to control multiple full modulation burners to maintain a given system pressure (or temperature), not to be used as a system high limit. The Multi-MOD will not necessarily bring the boilers down to low fire as the pressure approaches the set point. Instead, the set point of the Multi-MOD is the average pressure the Multi-MOD will modulate the boilers to maintain. Therefore, it is perfectly normal for the pressure to rise slightly over the set point. Set the Multi-MOD set point to the pressure you would like the system to hold, not the maximum pressure the system should reach.